This wall DOES NOT CONTAIN A STOCK PHOTO! ! ! Oh, wow! i love the outcome of this wall! The bg was done in PS CS2, and some edditing was made on my PS ellements 3.0. The whole bg was redone, well actually more like just remade from the original scan. And the gurl was also cleaned a bit. The birds, i love! they shine so cool, and white! ^^' Also, the text! OH MY GOD! i really wanted to make something more big, and pretty this time with the text, and i think i found it. The font is like usal Trajan Pro, and some filters on it, and also its overlayed to give it such "see through" and blueish effect XD! Very nicely done! I like the blurred effect, and the pose is so alive! The only issue I have is that the first two words aren't visible when it's in "small" format. However, this is quite pretty, and thanks for sharing! It's a simple wallpaper, but definitely a good thing. I like the motion blur effect you did for her, the textures are neat. The clouds though, I see some odd bright blue blotches here and there. Left over from the stock? It's a pretty wallpaper though, nice job on extracting and composition. I will agree with what has already been said. Your extraction is great (as always) and the blur effect gives a nice touch to it. nice textures! where do you get those flurry things.. me wants to know.. ^^ my fav too.. a very unique expression of magic and nature in one. this girl (and pic) is not from Blood+, she is the protagonist of the movie "Toki wo Kakeru Shoujo" .. anyway, great wall and very cool pic! aha! I knew SOMEONE was gonna wall this scan! I was going to wall it but felt too lazy. heheh. you did a great job on it! I like how youre going back to using stock photos rather than using bgs from other animes. it has a great feeling of freedom. I would say it look a bit odd with her being up in the sky so high, but hey, who cares? it looks great! gosh, i just love the colors! 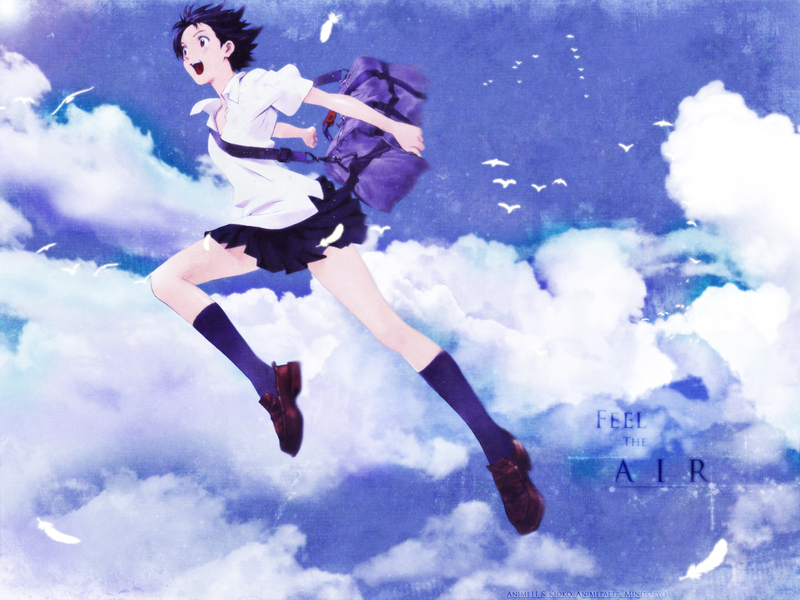 I would say that the wallie isnt that popular on animepaper because it seems very unoriginal with the sky bg and the girl flying you know? like its something you would expect to see if you looked at the scan (because i was thinking of doing the exact same thing with her flying in the sky, hehe, but im sure you did a better job than i would have). also, the bg is a stock photo (im guessing) and theres only the scan, the texture, some birds, and text. This is all that I can see from looking at the wall - im sure you put alot more into it than what Im guessing right now, but I really cant tell by looking at the wall. But i dont know, just besides the fact that this is a really simply made wall, i dont understand why it wouldnt be popular. (looks at comments on AP) well it seems like alot of people dont like the blur..but I think it looks good. I do see what they mean by uneven blur though, because you have some parts of her blurred while other parts arent. Like her shoulder and her other leg. wow! saya looks great and the sky is amazing! i love the texture! excelent work! Beautifuly done background :D The grundge brushes gave a nice effect to the wall :D Maybe a little less blurring? oh yeah I love this so much! The background looks great with the grunge added. Well I think you did an awesome job! I absolutely love the feeling. And the texture of the background is so beautiful!